While the Federal Communications Commission (the “FCC”) pre-empted most City control over these facilities, the City adopted the rules it could to address the community impacts permitted by the FCC. Health impacts of cell site radiation are specifically excluded from local regulation. PowerPoint presentation provided by Staff at the April 2, 2019, Council meeting. Defines SWFs as up to 50 feet in height, including antennas, or mounted on structures no more than 10% taller than other adjacent structures; or that do not extend existing structures on which they are located to a height of more than 50 feet or by more than 10 percent, whichever is greater; each antenna is no more than 3 cubic feet in volume, and the total associated wireless equipment on one structure is no more than 28 cubic feet in volume. Caps all fees that local governments can charge to the actual and reasonable cost of providing service. This limitation applies to fees for SWFs located on private property as well. Imposes shot clocks of 60 days for SWFs added to existing structures (regardless of whether the structure already supports a wireless service) and 90 days for SWFs proposing a new structure. The shortened shot clocks also apply to applications for SWFs on private property. The Federal Telecommunications Act is intended to ensure that the public has sufficient access to telecommunication services. Based on this Federal law, a local government shall not prohibit or have the effect of prohibiting the provision of personal wireless services. Further, no State or local government may dictate, or even consider, wireless entitlements based on “the environmental (health) effects of radio frequency emissions to the extent that such facilities comply with the Commission’s regulations concerning such emissions.” A zoning authority’s mere consideration of health effects, including potential effects on property values due to potential radio frequency emissions, may not serve as “substantial evidence” for purposes of denying a wireless facility. The City’s role in the siting and design of WCFs is generally limited to aesthetics. The new FCC Order significantly changes Federal law to shorten time frames and other requirements on local review of SWFs in the PROW. Now, if a city does not render a decision on a SWF application within a specified time period (60 days for installations on existing structures, and 90 days for new structures), the failure to meet the deadline for action will be presumed to violate federal law. On aesthetics, spacing restrictions and undergrounding requirements, the FCC declares that such requirements will not be preempted if they are reasonable, no more burdensome than those applied to other types of infrastructure deployments, and objective and published in advance. In essence, this new standard for aesthetic conditions means that cities can impose aesthetic requirements to the extent they are “technically feasible” for the provider. This is a significant departure from the “least intrusive means” analysis that developed in the Ninth Circuit over the last few decades. The FCC Order purports to overturn the “least intrusive means” standard entirely, with the new standards taking effect on April 15, 2019. Aesthetic standards implementing the FCC Order must be reasonable, objective, and published ahead of time. If a city does not have “published” its design standards, then it does not appear that any standards can be enforced. It is therefore important that the City update its ordinance with new standards and procedures by April 14, 2019, or shortly thereafter. Staff therefore recommends the Council adopt an ordinance setting out the permitting procedures for SWFs in the PROW. Add a new Chapter 12.28 to the Municipal Code, Wireless Facilities in the Public Right of Way. For all wireless facility installations in the PROW, the urgency ordinance provides, among other regulations, the permit and review procedures as well as the operation and maintenance standards. The ordinance treats wireless installations in the PROW similar to other installations in the ROW by requiring an encroachment permit. Once the encroachment permit is issued, the carrier may still need to obtain traffic control plans, construction permits and if necessary, a license to attach to City infrastructure. The substantially shorter “shot clocks” established by the FCC Order render discretionary review by the planning commission (or any other hearing body) much more difficult, if not logistically impossible. To this end, the proposed ordinance presents an entirely new administrative review process for SWF applications, with public works taking the lead of administratively reviewing SWF applications. The new ordinance recognizes, and establishes procedures and standards for, “eligible facility requests” pursuant to Federal law. These are ministerial modifications and collocations that must be approved by-right, which provisions were not included in the current Municipal Code, despite being required by law since 2012. Given the short time that the City has to act on these applications under Federal law, having two days to process appeals, staff recommends that the appeals be heard by an independent hearing officer, who can hold hearings on short notice within the short time frame. Doing so also provides an independent level of oversight over the decisions before they become final and subject to challenge in court. Staff sensed the importance of public awareness and involvement for wireless facilities. The ordinance thus requires applicants to provide mailed notices to owners, occupants and multi-family building property managers within _ feet of proposed SWFs and major facilities before they are approved. Finally, the ordinance allow the flexibility needed in the face of rapidly changing wireless laws and technology. 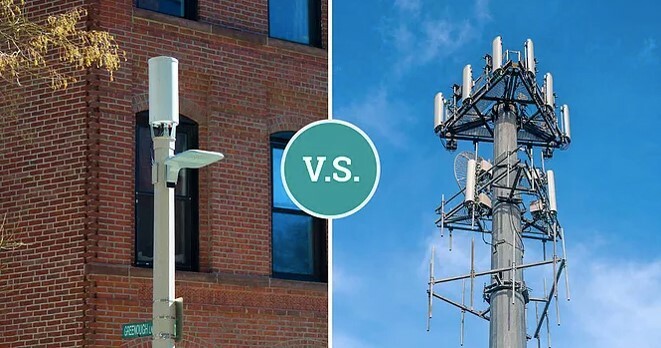 Rather than publish SWF design standards in the ordinance, staff proposes that such standards should be adopted as administrative regulations that may be readily and quickly adapted given the frequency and magnitude of changes in law and technology surrounding wireless installations. To accompany the new ordinance, the City Council adopted a Policy regarding small wireless facilities that provides the industry direction on the City’s aesthetic, location and design requirements. For example, the design standards recommend that when there is a choice in location, carriers should choose to site on a pole or street light that is between structures and not immediately adjacent to a structure, that paint and design should blend with surrounding structures, that signage should be limited, and that lighting be prohibited unless required by the Federal Aviation Administration.